Check it out! The San Francisco Anti-Displacement Coalition, which includes Housing Rights Committee of San Francisco and other housing justice groups throughout the city, just released a new tenant rights poster campaign on city buses along with new multi-language resource site: SFADC.org. This is the first site in the city with know-your-tenant-rights info in 6 languages! Spread the word! Visit SFADC’s new multi-language tenant rights and resources site: SFADC.org. 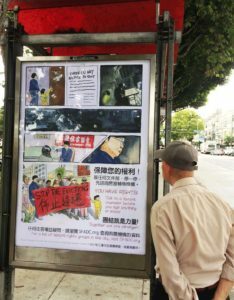 Poster made by Kayan Cheung Miaw for the SFADC in collaboration with the Community Tenant’s Association in Chinatown, spring 2017, installed on the Muni bus shelter.